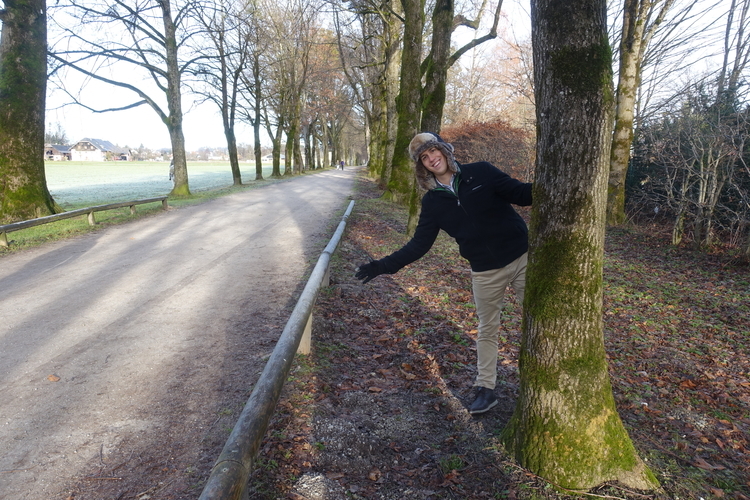 While we were in Salzburg, something that we absolutely "had to do" was a Sound of Music tour of some sort. Now, I have to say, this was also something I really tried to get out of. We read blogs about "Self-Guided Sound of Music Tours," both those by foot and by car, and we poured over reviews about guided tours offered as well. I was skeptical - despite the fact that I was given the Sound of Music one year for Christmas (by Danny, I might add), I'm really not its biggest fan. D - Let's start at the very beginning - a very good place to start. When you learn how to read, it's A, B, C. When you learn how to...sorry, that's just a little Sound of Music reference to grease your gears and get you ready for this post. We started out that fateful day by eating breakfast at Heart of Joy Cafe a couple blocks away from where the tour would start. As our tour tickets very clearly stated that we should get to the meeting point fifteen minutes early, I was a bit stressed out over breakfast that we would be able to make it in time. We told our waitress that we didn't have much time and she was very gracious, and more importantly, was very expedient throughout our meal. The food came quickly and it was delicious! Some of the best french toast I've had at a restaurant for quite some time. D - Even with our speedy waitress, we were still cutting it pretty close by the time we left. We left the restaurant power walking to our meeting point, rounded the corner of the block, and then let out a sigh of relief. We could see the buses! And they were glorious! Then I noticed something that made me start power walking yet again...the line of people waiting for the tour was enormous (even though we did, in fact, arrive fifteen minutes beforehand)! Though I despised math throughout all my years in school, I felt compelled to count the number of people in front of us against the number of available seats on the buses present and I started to get worried. It didn't seem like there would be enough seats! Did they sell too many tickets? I didn't want a refund, I wanted the tour! Then, like a miracle rain that breathes life into a dry and parched land on the brink of total desolation, more buses soon pulled in to the meeting point: four official Sound of Music Tour buses, and one regular coach bus. The line slowly dwindled and it looked like we might just snag a seat on the last official bus, but we elected to defer to the regular coach bus so that we could really have our pick of the litter when it came to seating. While I was a bit sad about this development, it seemed like the only real difference was the bus exterior and I was still able to take advantage of some great photo-ops throughout the course of the tour when all of the buses stopped in the same places. The buses...Danny was really stressed about the buses, and I even remember a brief conversation we had about us contacting the company after the tour and asking for a partial refund since we didn't get to ride on an 'official bus.' The thought was quickly forgotten, but it was definitely a good reminder to get places early! D - Our first stop of the tour was at Leopoldskron Palace. The palace serves as the back of the Von Trapp family home in the movies and is also where the lake scene was filmed. On the drive there, it became evident that we wouldn't, in fact, be singing the entire time on the bus, quite as I had hoped, but instead would also be receiving some interesting information about Salzburg and its history. As we were getting off the bus with everyone I asked our guide when the singing would be getting started. She was a bit taken aback, but let me know that it would start as we made our way through the mountains and had more time between stops. The palace was great! Stately and majestic just like in the movie, and it was fun to hear some of the behind the scenes information from our tour guide about the manor and the lake scene. I've already mentioned how I wasn't necessarily looking forward to the tour, especially as the preview online made it look like one big sing-along. However, we quickly realized that that wasn't going to be the case at all, which ended up being disappointing for Danny, but a pleasant surprise for me as I really enjoyed hearing all of the facts and tidbits our guide shared about Salzburg and the surrounding area as we drove around. I also really enjoyed the stop at Leopoldskron Palace, but it was one of the times where I wished we were on our own, and not someone else's timetable, as it would've been nice to walk all the way around the lake to get different views and explore a little bit more. 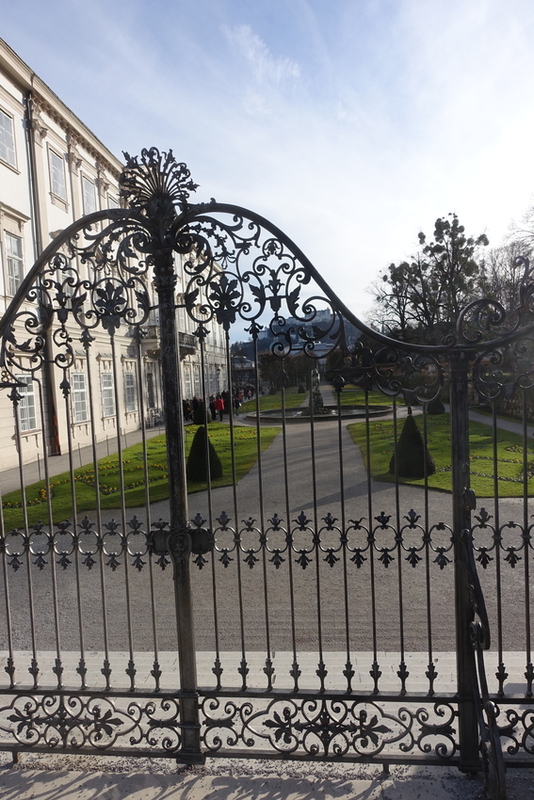 D - The next stop on the tour was Hellbrunn Palace, not because it's in The Sound of Music, but because the gazebo from "16 Going on 17" and "Something Good" is permanently kept there. It used to be kept somewhere else and unlocked and open to the public but was moved after enduring too much love from rabid fans. Now, the doors are shut to the public, but one can still get close and feel the intensity of the movie magic pulsing and radiating off of it. As we got off the bus at this stop, our tour guide was the one to catch me off guard. She asked me what my name was, and told me she was going to call me out once the singing started. "Great!" I told her confidently, "I can't wait." Secretly though, I really started to sweat. You see, despite my profound love for being the center of attention, performing, and The Sound of Music, I've only really seen the movie in its entirety about five times, and I only know all the words to one song - "Do Re Mi." I didn't want to be put on the spot and embarrass myself in front of a gathering of Sound of Music lovers. It's kind of funny to see a bunch of tourists get dropped off in front of a beautiful, historical palace, take pictures of a gazebo out front, and then get back on the buses and leave, but that's what happened. That's the power of The Sound of Music. Also seen at this stop was a dirt road that's used in the movie in a scene where the kids are playing in their new clothes and hanging from trees as the Captain and the Baroness drive past them without realizing that the kids are the Captain's own clan. 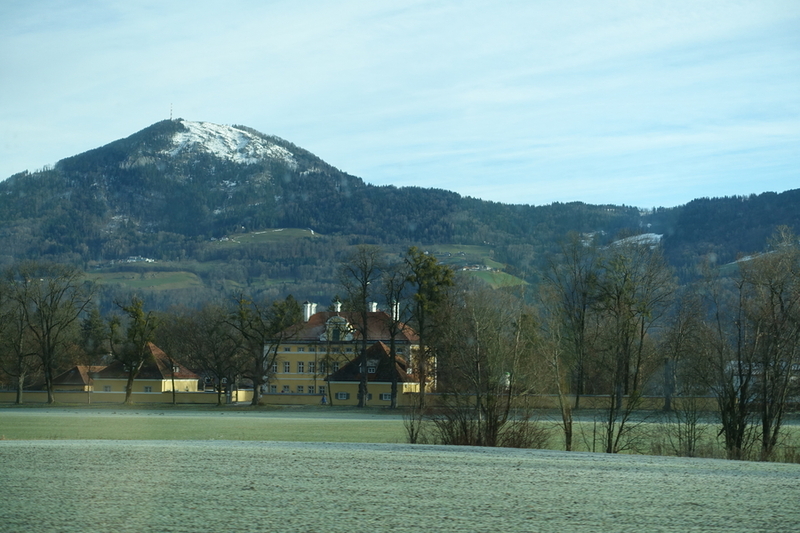 Additionally, on the way to and from Hellbrunn the bus drove past Schloss Frohnburg a 17th-century country home used for the intimidating gates and front entrance of the Von Trapp manor in the film. We didn't get the best pictures of the building (now the Mozarteum Music Academy), but that's bus photography for you. That would have been one of the few advantages of doing a self-guided tour - much greater freedom and flexibility. D - Next up, the bus drove by Nonnberg Abbey, where the "real" Maria was a novice. I'm going to be honest, most of the time, I prefer to pretend like the real Von Trapps didn't exist, as their true story differs quite a bit from the movie, and I like the movie better. The bus continued on to the next stop and the music started. I sat anxiously waiting for my humiliation to come, but mercifully it never did. Instead, at one point during the first song our guide called out from the front of the bus, "I can't hear you, Danny!" And so the tour continued, the bus drove up, and up, and up - out of Salzburg and into the surrounding mountains. The scenery was magnificent and our guide continued to provide us with interesting commentary about Salzburg and the gorgeous setting of The Sound of Music. We stopped at a designated pull-off overlooking the town of St. Gilgen and Lake Wolfgang and futilely tried to capture the beauty of the fog hanging over the lake below while boats glided silently (at least from where we were standing) over the calm waters. The Salzburg Lake District was used for several panorama shots in the movie as well as for the picnic scene at the start of "Do Re Mi." Apparently, the song was filmed all over Salzburg and the surrounding area. Maria and the kids must have been feeling very fit that day! D - The final stop of the tour was in the town of Mondsee, where the wedding chapel used in the film is. While the...ahem..."real" Von Trapps got married in Nonnberg Abbey, that wasn't really fancy enough for Hollywood and so they chose this location a mere 30 kilometers away. To be honest, I don't remember the wedding scene very much from the movie (I really need to watch it again!) but it's a nice church and a charming town on the edge of a stunning lake, so it was a fine last stop for the tour. 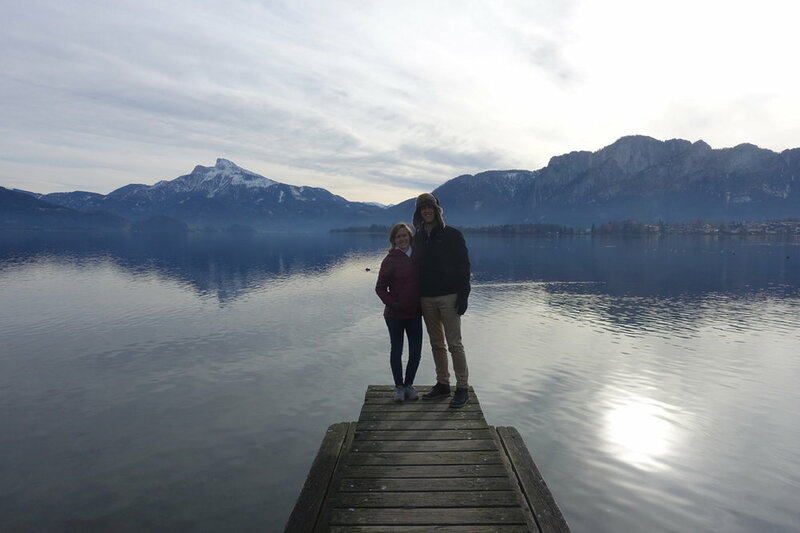 After viewing the church, we walked down to the lake and spent some time admiring the views before getting back on the bus to go back to Salzburg. The ride back on the highway wasn't very pretty (after all, the tour was essentially finished), but it was filled with some great singing opportunities! As it turns out, most people on the bus were too shy to sing, but I was thankful to be sitting in front of a Sound of Music superfan who knew all the words to every song. That last sentence might read as sarcasm but I'm being completely serious. I wanted to sing as much as possible! We really turned it up for "Do Re Mi" and brought the whole bus to thunderous applause (at least in my recollection). D - At the end of the tour, our guide invited us to walk across the street from where we first started and check out Mirabell Gardens, another filming location for "Do Re Mi." It was nice but the gardens required an entrance fee to tour so we just admired it from outside the gate. 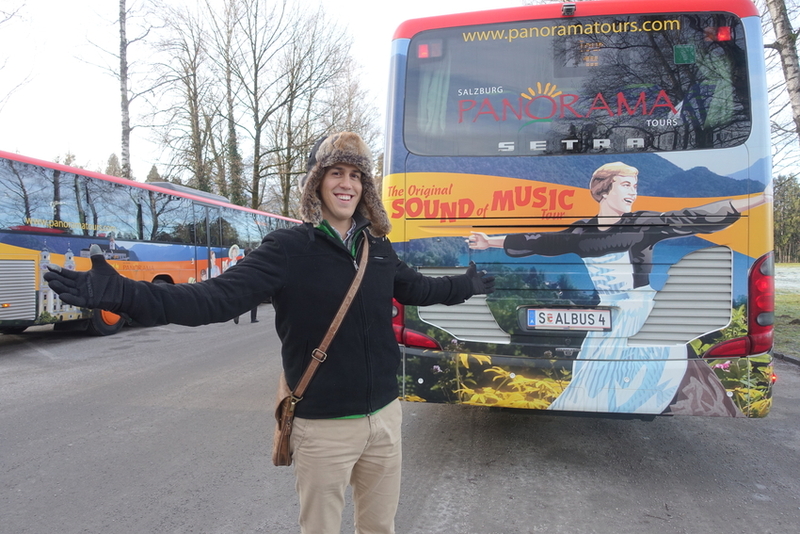 D - So that was our experience on the Sound of Music Tour. Was it worth the price of admission? Well, it was a pretty fun time and we got to see a lot of the surrounding area of Salzburg that we wouldn't have gotten to see otherwise. If I could change a few things about the tour I would start with the music. They really need to give song sheets to everyone or have karaoke-style screens on the bus (like I expected) so that people can really let loose and sing along without the additional fear of not knowing all the words. If you go on the tour, I recommend you bring the lyrics along somehow. The more you sing, the more fun you'll have (at least that's the case for me). Also, all the guides should be wearing traditional Austrian folk costumes. I believe this is obvious and needs no further explanation. Overall though, the tour was interesting and well done, and I got to check something off of my bucket list. If you're a Sound of Music fan, I'd highly recommend it. I'm not sure I'd draw all the same conclusions, but the bottom line for me is that I'm just glad Danny had a good time on the tour. It was an unexcepted bonus that we got some info on Salzburg (and the surrounding area) in between Sound of Music sights, and plus getting to some of the mountains and lakes was pretty great since we didn't have a car on this trip. I do think I'd probably still prefer a self-guided tour via car (I could even be convinced to play the movie soundtrack as we drive! ), but that's probably just because of my personality that prefers smaller groups over larger ones. D - So long! Farewell! Auf wiedersehen, goodbye!